With the concept of Android emulators spreading from mobile application developers to gamers and to the general population, people have learned that they no longer need an Android phone to use Android apps. Android emulators bring more than 1 million games and apps from the Google Play Store directly to your computer. Bluestacks is the current leader in this market. However, its user interface is very inflexible and its home page is filled with suggested games. Its new rival Nox App Player, on the contrary, provides users a clean and complete Android (4.4.2 KitKat) experience. Nox App Player has low CPU and RAM usage while delivering outstanding performance. On Antutu benchmark, Nox scored 61,386 which is pretty impressive compared to Bluestacks 42,464 test result on the same computer (Windows 7, 64 bit, Intel i3, 8 GB memory). With the freedom to further customize the CPU and RAM utilization of Nox, users will be able to unlock more of its potential and emulate any Android function as on a computer. Users can use either full-screen or windowed mode, and the window is completely flexible and resizable. Nox even provides an interface that looks similar in all respects to that of a real Android phone/tablet. The Nox App Player also has Google Play integrated which makes things much easier. You could download and run the games and apps from the Google Play Store directly in the emulator. From the popular Clash of Clans to the Marvel Series and WhatsApp Messenger, the performance is fast and stable. It has been tested on Windows 7 to Windows 10 and using Intel or AMD processors. 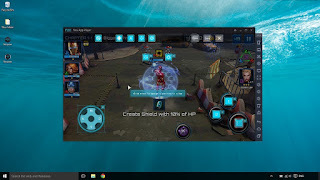 The best part of running a mobile ARPG (Action Role Play Game) on computer with Nox is that you can control the game with your keyboard and mouse. This brings a traditional video game flavor to the gaming experience and also boosts the player's score. The software is also programmed to automatically detect and connect to controller. So if you have a gamepad or controller, you could connect it to Nox by simply plug it in. This feature is quite handy when playing Action games. Another important feature is that Nox is rooted. This is a great entertainment tool for general users and an outstanding development tool for Android developers. It can be connected with Android studio with ease and is highly useful for testing newly developed applications in a full-featured Android environment. What makes Nox more appealing is the multiplayer mode, which allows users to run multiple instances of Nox App Player on the same computer simultaneously. In each instance, they can run a different game or app. It's like having several Android phones laid out in front of you, and you can chat with friends in one of them and play your favorite game in the other. There is no need to worry about running out of battery or being interrupted by phone calls. Nox App Player is also free. You don't have to install any recommended apps or pay a monthly fee for the full features. It should be noted that the downloaded process is quite slow since Nox App Player's server is located in Asia, but the great features surely make up for it. There is a current issue with some video apps however the team is working on an update. Duodian Network is a tech startup focusing on Android emulator development. Its main product Nox App Player is a powerful Android emulator that can run Android games and apps on PCs. 0 comments on "Nox App Player is a FREE Android 4.4.2 emulator that can run Android games and apps on PCs"